Our next spotlight artists are Blue Coupe, a band comprised of three rock & roll legends: Albert and Joe Bouchard, founding members of Blue Öyster Cult, and 2011 Rock and Roll Hall of Fame inductee Dennis Dunaway, founder of the Alice Cooper Group. We were introduced to drummer Albert Bouchard by our friend Joe Hurley. 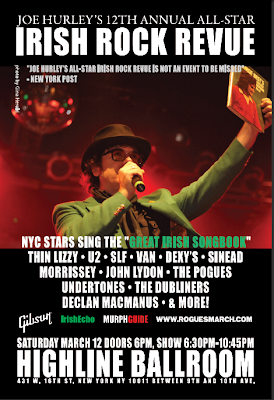 Albert and Dennis will be performing this Saturday at Joe Hurley’s Irish Rock Revue. We share vocal duties with my brother Joe handling most of the vocals. Dennis Dunaway conceived the bands name. He said he liked bands that have blue in the name like Blue Oyster Cult and we could also acknowledge our past. We figured that if we spelled coupe COUPE that we wouldn’t get in trouble with the Alice Cooper camp. We played our first official gig in the winter of 2008 but we have jammed together for years before that. We first met Dennis in 1973 when Blue Oyster Cult was asked to open the show for the Alice Cooper group. Since then, Joe has been in groups with Dennis and I have jammed with them from time to time. Joe and I have been playing in bands together since before high school. Our first gig was playing for the Boy Scout dance. We played together all through high school and then when I went to college we played in different bands. One of the bands I played with was called Soft White Underbelly. We got together on Long Island and actually got signed to Elektra records. When we got dropped from Elektra records my brother Joe join the group and we change our name to Blue Oyster Cult and got signed to Columbia records. My mother, Frances Ryan, was a huge musical influence on me. She was a huge fan of Bing Crosby and had every record he made. When I was a baby she would play these records all the time. When I was five my dad got a job overseas in Salonika, Greece. On the trip back from Greece all the records were broken. But my mother always sang around the house. When she was young she wrote songs with her brother, John Ryan. My dad was into gospel music. He loved Mahalia Jackson and Benny Goodman. The first drummer that I wanted to be was Gene Krupa. When I was a teenager I got into rock ‘n roll and I loved the Ventures, the Beach Boys, the Beatles and the Who. Some memorable gigs for me were the Paramount Theater in Seattle, the World Series of Rock in Cleveland Ohio, Day on the Green in Oakland, California and the Black and Blue show in Honolulu, Hawaii. I have several groups and artists that I’m working with in addition to Blue Coupe. I just produced a record by singer named Marlene Villafane, and am about to release a digital single with the singer from the Soft White Underbelly in a new group called simply, Underbelly. I’ve also worked with some talented young ladies who have a group called Left on Red. Finally, I’m also working on a posthumous album by my good friend, David Roter. Of course, Blue Coupe is already working on our next recording. My music is all available on iTunes and CD Baby. I think they license it out to Amazon and super D one-stop. Of course the Blue Oyster Cult stuff is available anywhere recordings are sold. Probably one of the coolest gigs I’ve done ever was playing on the float at the Halloween parade in Greenwich Village. I think it was the most people I’ve ever seen see me play live. It was a funny show because when the float would get to the end of the block it would stop and we will play the same songs that we played on the last block. It was also a great practice session. Play as much as you can. Don’t worry about the money until you get really popular. Try to associate with people who are better musicians than you are. Learn the songs that you like, as well as you can. That will become your musical vocabulary. You are performing Saturday at Joe Hurley’s annual Irish Rock Revue. How did that come about? What songs will you be performing? I have been hearing about the show for years and last year I went for the first time. I thought it was fantastic and immediately wanted to join in the fun on stage. I also felt that I’d like to pay tribute to my substantial Irish heritage. I have a French last name so people don’t usually think that I’m half Irish. About five years ago I went to Dublin and got my Irish citizenship so now I’m a dual citizen. I even have an Irish passport. Anyway, Dennis and I bugged Joe for most of the year to get us on the bill. We will be performing “The Hands that Built America” by U2 and “ School’s Out” by Alice Cooper. I read that you teach in a Manhattan high school. Are you still teaching? Please provide any insight on how interacting with young people has had an impact (if any) on your music and conversely, your musical influence on students. Yes, I still teach music at Westside high school, in Manhattan. I’ve been here for over 20 years. As a musician I have to admit it’s a pretty good gig. There’s a lot of structure involved, like getting up early in the morning every day, and not just being on time but being early, and making lesson plans that conform to the national standards, every day. But for me it’s not too hard because I feel that I have a lifetime of background knowledge in every aspect of music. Another cool thing is that I feel very current about what is happening in music today, not only what our teenagers are listening to, but how they listen and where they listen to music. People might be surprised that most of my students have a fairly wide appreciation for all kinds of music, not just hip-hop, or heavy metal, but jazz, Latin, classical, rhythm and blues and soul. 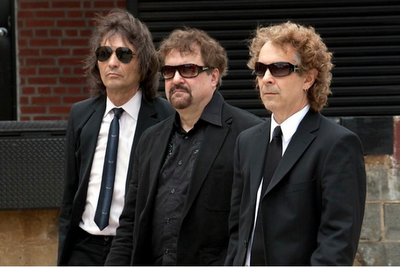 As a founding member of Blue Oyster Cult, what is your greatest memory of that period of your life? Two memories which stand out for me right now are the first time I heard my song on the radio, and the instant when I was recording my first hit song. We were all traveling in the band van to go to Passaic, New Jersey to see the Alice Cooper group live for the first time. Just as we were crossing the George Washington Bridge, Dan Ingram on WABC AM radio played “Cities on Flame” which was our first single. We were all very excited, but I remember thinking that it sounded radically different from any other song that the station was playing. So it wasn’t surprising to me that the song was never a big hit. I remember recording the drum part to “Don’t Fear the Reaper” in studio C at the Record Plant in New York. We recorded the basic track with no vocal so I had to picture where the vocal was in my mind as we recording song. When we got to the ending I wasn’t sure where the end of the verse was but I just had a feeling that the verse was over and I started hitting the crash cymbal on the back beat. When I did that I started thinking that I was listening to the radio and that I wasn’t even playing. It was a complete out of body experience, one that is not happened to me very often. You have performed with your brother for a long time. Did you grow up in a musical family? Is there a next generation of musical Bouchards that we may hear about? My mother played the piano and my father played guitar but never together, as far as I can remember. My father really didn’t play guitar that much although one of my uncles told me a few years ago that my dad originally taught my uncle Bill how to play guitar and my uncle Bill taught his son, my cousin Teddy, and my brother and myself how to play guitar. Both my sons, Jake and Ace, play musical instruments and know a lot about music but I don’t know that they will follow my footsteps. Most of my nieces and nephews play instruments also and one nephew, Grey Bouchard, has had several bands and is involved in a successful group in Ann Arbor, Michigan right now. Any comments on the SNL cowbell sketch, the fictional parody of the making of “Don’t Fear the Reaper”? Did you actually play cowbell on that song, or did Eric? I think the skit is hysterical. 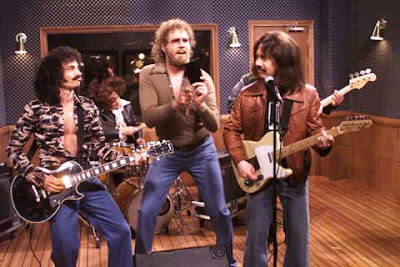 Sometimes it seems like a cowbell joke gets a little old to me personally, but I always laugh whenever I see the skit and I’ve seen it 100 times. Eric might be a little confused about who did it, but I remember because I was there and I did it. The producer David Lucas asked me to play it and he gave me a little 5 inch cha-cha bell which he thought would sound good on the song. I overdubbed the cowbell and it didn’t sound right, so David said, “just tapes and gaffer tape around” and I did but it still didn’t sound right. I suggested I use one of my timpani mallets to make a softer sound and that seemed to do the trick. I remember I asked David why he wanted the cowbell on there because I thought the track was pretty steady and didn’t need any help with the percussion. He told me he just thought the sound would be good for the song. We only had one track to use so all of percussion had to go on that one track. Eventually David Lucas played guitar on the track and Donald (Buck Dharma), played the vibra-slap and in the middle of the song I got to play a little tiny triangle. The reason why Eric might be confused is number one, Will Ferrell dressed up to look like Eric when he was playing the part in the skit and secondly, when we played live Eric always played the cowbell parts and was a really good percussionist as well. I don’t know if Eric was there when we did the cowbell part so maybe that’s why he didn’t do it, or maybe David Lucas just wanted me to do it for some reason. Anyway, it’s kind of ironic that the comedy skit sort of paralleled real life. Your bandmate in Blue Coupe, Dennis Dunaway will get inducted in the Rock & Roll Hall of Fame next week. How did you get together with him to form this band? I think it’s fantastic that Dennis and the rest of the guys from Alice Cooper have been chosen by the Rock Hall of Fame. Even though we had jammed together at different times, we decided to form this group after a club owner in Eastern Pennsylvania paid us a lot of money to play at his club. The gig was weird and out of the way, but the room was packed and we had a fabulous time. We are the group that hardly ever practices but we do do a lot of homework when we have a show to do. We have never had a bad gig. Each year we’ve been together we do something new and different and fun. Last year we made our first record at the urging for Robby Krieger from the Doors. Robby even played guitar on some of the songs.